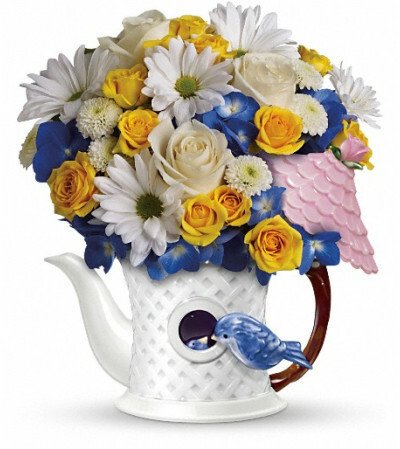 Make Mom’s day a fun day with cheerful flowers in a whimsical teapot graced with a sculpted, hand-painted bluebird. 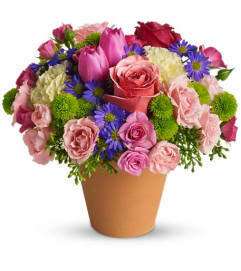 She’ll love the flowers and think of you every time she brews a cup of tea. 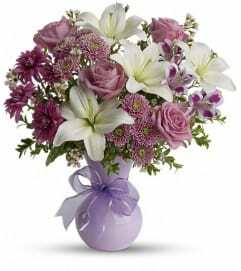 The delightful bouquet includes yellow spray roses, white button spray chrysanthemums, blue hydrangea and white daisy spray chrysanthemums. Delivered in a hand-painted ceramic teapot that looks like a birdhouse – complete with a bluebird.